Collections composed of low tables-benches and a chaise longue, obtained by gluing together three slabs of smoked glass or transparent extralight glass ( the chaise longue is only in smoked glass), so that they look like a joist. The top-seat and the base are in mm. 12 thick tempered glass, whereas the vertical support is in laminated glass. 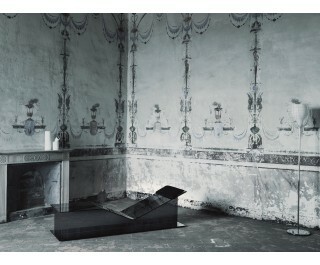 The chaise longue has the seat in curved glass, supported by a vertical shaped element. Although the glass junction is very little and linear, the adoption of high resistant structural gluing enables the use of these elements as seats. The collection is completed by removable cushions in a black colour fabric.